The global financial crisis in 2008 hit New Zealand hard, so much so that the government held an emergency jobs summit. Politicians and businesspeople were pulled together to come up with plans and schemes that would create jobs and boost the economy. One of the more successful ventures was a strategy to build cycle trails all around New Zealand. Not only would this produce jobs for then and in the future, it would also give Kiwis a great way to see all that New Zealand had to offer. The New Zealand Cycle Trail incorporates 22 great rides through some of New Zealand’s most breathtaking landscapes. 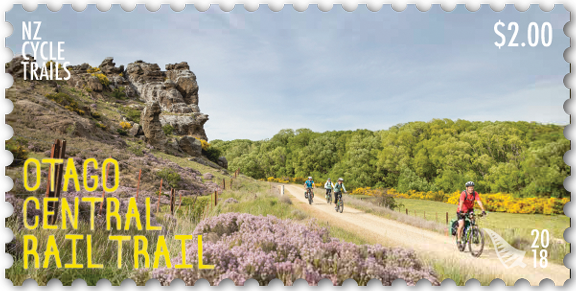 From restored heritage trails, epic swing bridges and curious wildlife to luxury accommodation and good food, the cycle trail offers something for everyone. Many of the trails can be broken up and done across multiple days, or even just tackled a section at a time if you’re after a day trip. The difficulty of each trail varies with the location and terrain; some roll with the landscape while others follow pre-forged paths that were once railway lines or horse tracks. Regardless of the style of trail, difficulty level or length of the journey, you’ll experience New Zealand’s landscape in a unique way. 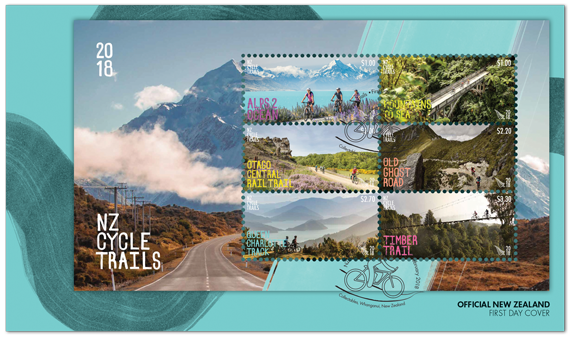 In early 2018 NZ Post issued this set of six stamps featuring six of the best of these cycle trails. The portrait format they chose is ideal for displaying some of the beautiful scenery found on these trials. Of course, there was also the usual First Day Covers and Miniature Sheet. There was also a presentation Pack including all three of the collector items above plus lots more information regarding each track. $1.00 - Alps 2 Ocean. 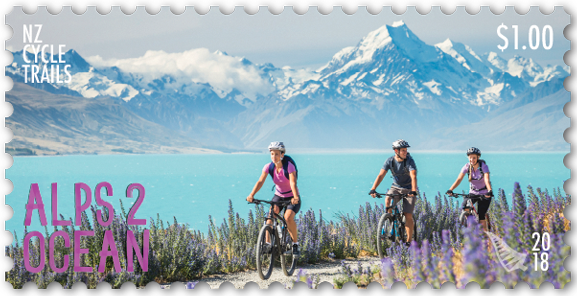 New Zealand’s highest mountain, Aoraki/Mount Cook forms the cornerstone of the country’s longest cycle trail. With the Southern Alps at its back, this 300-kilometre-long trail descends 540 metres to a long pier at the edge of the Pacific Ocean. Along the way, riders pass through the historic sheep country of the Mackenzie Basin, the hydro-electric power stations of the Waitaki Valley, and the fossilised remains of giant penguins and tiger-like dolphins at Duntroon’s fascinating Vanished World Centre. $1.00 - Mountains to Sea. From the slopes of Mount Ruapehu, a rich history of the central North Island unfolds in this 226-kilometre, multi-day adventure. A cobbled coach road leads to quiet country lanes and into Whanganui National Park, passing long-deserted settlements on its way to the iconic Bridge to Nowhere. Opened in 1936 and abandoned shortly afterwards, the bridge now lies surrounded by wilderness. A boat ride follows, down the Whanganui River to Pipiriki and the River Road to Whanganui and the Tasman Sea. 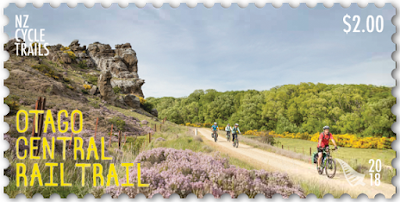 $2.00 - Otago Central Rail Trail. In the bitter winter of 1879, construction began on a rail line through the iconic rolling tussock-lands of Central Otago. 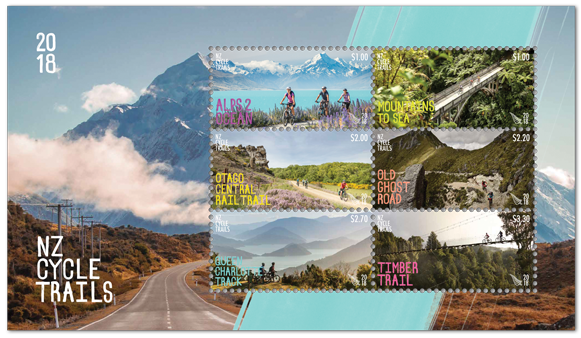 How could the workers have imagined that, 120 years later, their creation would become New Zealand’s first multi-day rail trail and the flagship of New Zealand Cycle Trails? For visitors, it provides the best way to explore Otago’s iconic rocky landscapes and impressive tunnels and viaducts, and the small communities dotted along the 150-kilometre-long trail, offering exceptional accommodation and cuisine. $2.20 - Old Ghost Road. In the 1860s gold was discovered at the southern end of the Ghost Road, and the bustling settlement of Lyell sprang up. Today, all that remains is a graveyard and an old mining trail that has inspired one of the greatest multi-day mountain-bike trails in the world. The Old Ghost Road is a challenging trail that rewards those who dare to ride it with breathtaking scenery and 85 kilometres of continuous single-trail bike-hopping from mountain hut to mountain hut. $2.70 - Queen Charlotte Track. 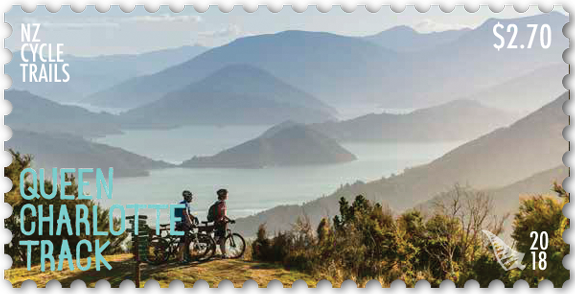 This 72-kilometre, two- or three-day trail stitches together two sunken valleys of the Marlborough Sounds, offering a unique combination of adventurous mountain biking through regenerating bush with coastal views and seaside resorts. A boat trip to the outer reaches of Queen Charlotte Sound, Ship Cove, sets the scene. This is where explorer Captain James Cook came ashore five times in the 1770s to restock supplies and undertake ship repairs. It makes for an auspicious start to a rewarding ride. 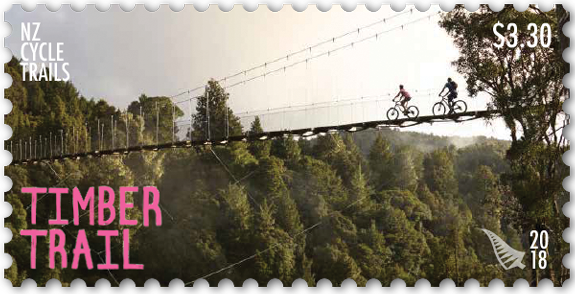 Opened in 2013, this 85-kilometre-long trail is a favourite with lovers of the outdoors. 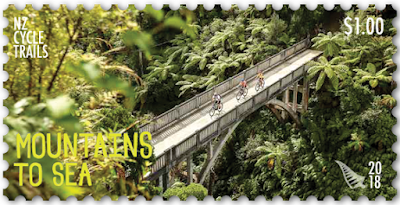 From the edge of the celebrated Pureora Forest Park, west of Taupō, it meanders through ancient rainforest. Kererū and kākā skim the canopy of giant rimu, tōtara and kahikatea, while kōkako add chimes of gold in the dawn chorus. The trail skirts the ancient volcano of Mount Pureora, then continues westwards across several impressive suspension bridges and along a historic bush tramline to the village of Ongarue. First Day Covers and Miniature Sheet. 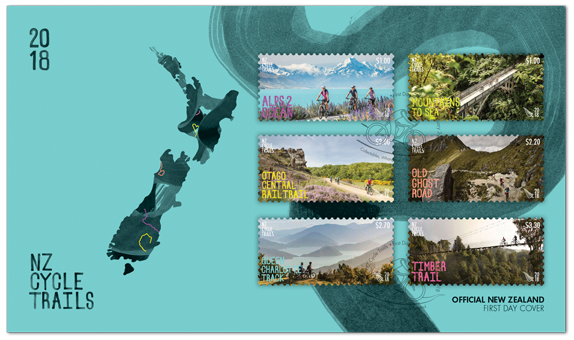 The first-day cover features a map of New Zealand with a colour-coded line for each trail. The lines show the location of each trail and correspond to the colour of each stamp title. The miniature sheet features the majestic Aoraki/Mount Cook as seen when completing the Alps 2 Ocean trail in the Mackenzie country. First Day Cover - 7 February 2018. Miniature Sheet with two $1, one $2, one $2.20, one $2.70 and one $3.30 stamp. Miniature Sheet First Day Cover - 7 February 2018. 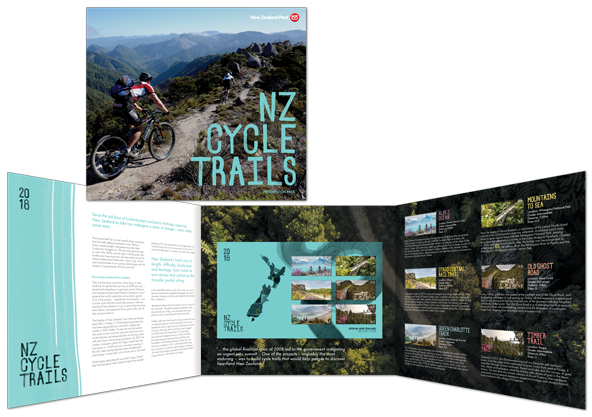 Discover more about the history of cycling in New Zealand and what led to the building of New Zealand’s cycle trails with this presentation pack. 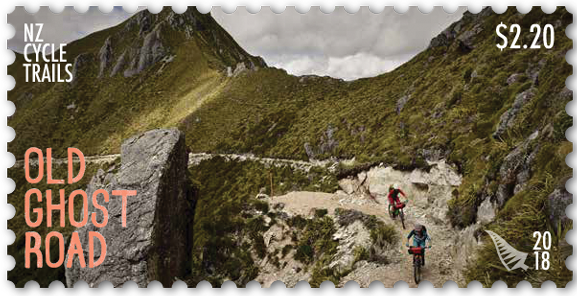 This pack came complete with a set of stamps, miniature sheet and first-day cover. Date of issue: 7 February 2018. Denominations: Gummed: $1.00 x 2, $2.00, $2.20, $2.70 and $3.30. Designed by: Strategy Creative, Wellington, New Zealand. Number of colours: Four process colours plus unique special colours. Six unique special colours: $1.00 PMS pantone purple; $1.00 PMS 388 bright yellow-green; $2.00 PMS 102 bright yellow; $2.20 PMS 1635 pale vermillion; $2.70 PMS 3242 pale tirquoise-blue; $3.30 PMS 232 bright purple-red. 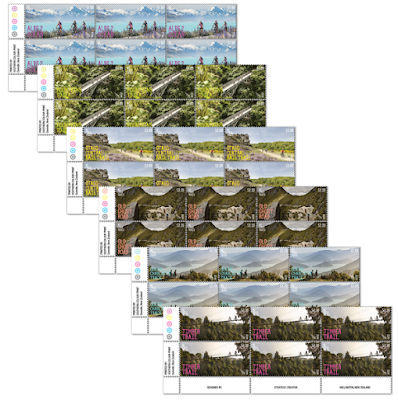 Stamp size and format: 50mm x 25mm (horizontal). 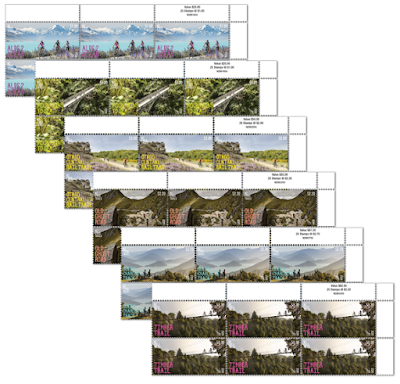 Miniature sheet size and format: 170mm x 100mm (horizontal). 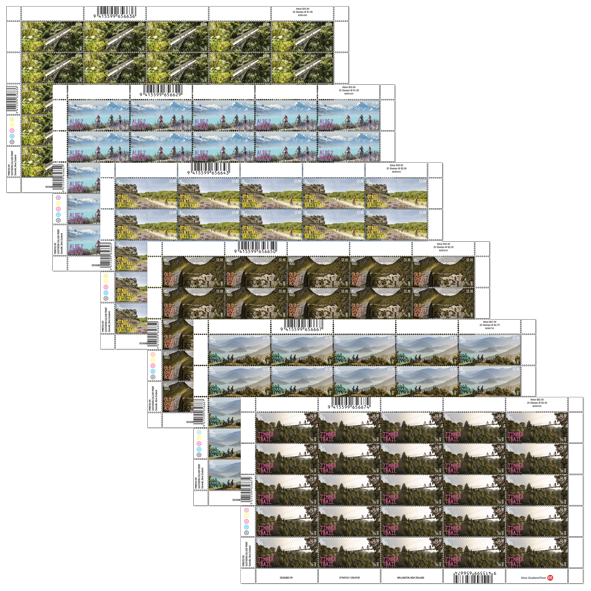 Special blocks: Plate/imprint blocks may be obtained by purchasing at least six stamps from a sheet. Barcode blocks are available in A and B formats. Period of sale: Unless stocks are exhausted earlier, these stamps will remain on sale until 6 February 2019. First-day covers will remain on sale until 6 April 2018.